The spicy curry cooking on the stove and a cloudy weather outside is just what I need on a lazy day like today. With this kind of weather you can hardly blame me if spicy rich food invades my mind. I know I talked about doing an Italian fare this week but I just couldn't help myself. I am too Malayalee I suppose. Rainy, cloudy weather is reminiscent of monsoon holidays and comfort food. Therefore, will you forgive me? Shall we take a look at a spicy, tantalizing fare? The curry is cooked with pork shoulders. The shoulder meat is lined with gooey fat (gooey when cooked) making the taste exquisite. Now, here I am not blowing smoke about my culinary skills. I am just saying pork shoulder meat has a lot of fat and it's very tasty. Thanks to J my friend who suggested I buy pork shoulder for curry. Now to brag just a little about the curry. The gravy has a nutty flavor exuding from the fried coconut. This teamed with curry leaves and all the other spices makes it quite South Indian which means utterly tasty. A 'hit your senses' kind of dish ironing smooth with coconut. If you have not yet cooked with this gravy you should. Agreed it's pungent and the dish bursts with a medley of flavor. Even then the fried coconut, to repeat myself, adds dimension soothing the piquant spices. For me, it recreate the smell and taste of Kerala. I know I said I will just brag a lil but you see..Sigh! Couldn't help myself. Anyways, to get you down from the high of a host of spices bite into Brussels sprouts. The wedges arev sauteed in butter to perfection(read a little crunchy yet cooked). Heat oil in a pan add 'I can't believe it's not butter' wait till it melts and plop in the wedges. Stir it around briskly till the white of the sprouts are mottled with brown. You may be thinking "what the heck" well, I understand your sentiments. 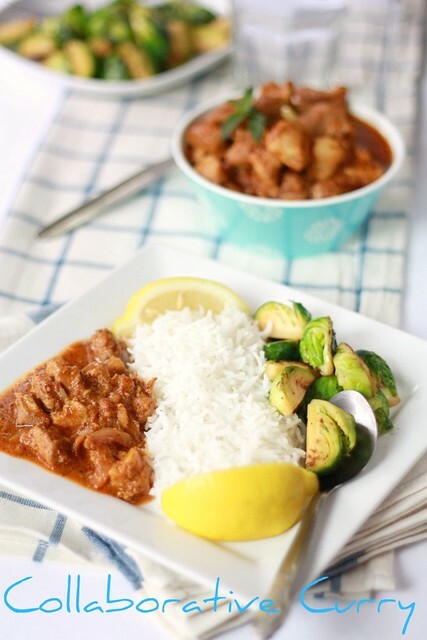 Mixing Indian and a totally American recipe may sound ludicrous but believe me spicy curry served with hot jasmine rice and buttery sprouts are complementary. 1. Take meat, 1/2 tspn turmeric and salt; pressure cook for 3 whistles set aside. 4. Add the meat and all its water to the above and cook off the water at least half of it. I like pork fry and have often tried it from Mammas restaurant in Cochin. Pork varatharachathu is new to me and I am unknown about its take. The pics look good and delicious. never thought of preparing it. Let';s try. Although I don't eat pork, I have to say this looks very delicious. Not really attracted to pork the way i shud be, and so m not too familiar with the various preps...varutharacha technique looks cool. Delicious platter..must be a hit with pork lovers!! 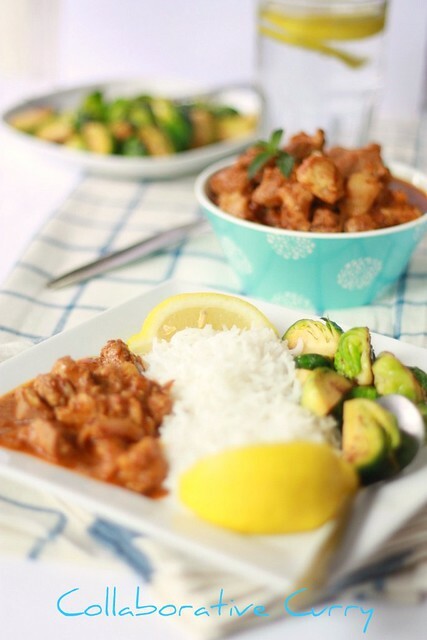 never had pork but dis recipe looks yummy and spicy! as usual nice presentation and click! Looks tempting though I dont take pork! 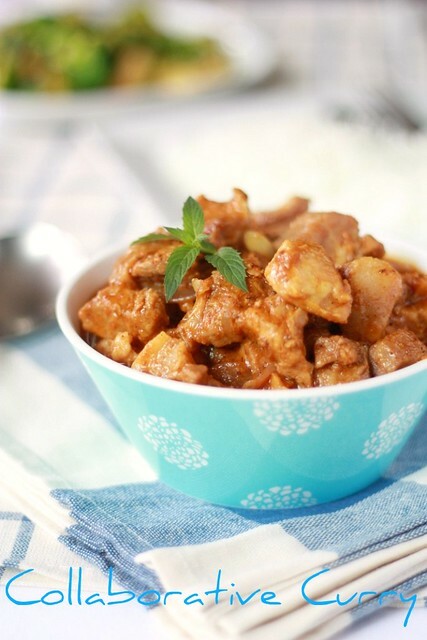 am not a meat eater but Hubby loves pork especially this type of curries with coconut gravy. This looks simply delish! LOve the coconut gravy. love that ikea bowl..i just got 2 of those last week ;).. This is a mouth watering dish :) And the presentation/mixing things up is refreshing too!! waaaahhhhhhhh you are tempting me to death!! Lovely Lovely curry! and beautiful presentation!!! Varutharacha pork curry adipoli..looks so good. Awesome pictures, especially the last one..I have never tasted varutharacha curry with pork, looks fantastic..
tried it - very good! my colour was a little darker thou!